JPMorgan announced a $2 billion loss Friday. When compared to its market cap and other indicators, that goes Ouch!, but not much more. However, there’s more going on. The bank has refused to state where in its operations the loss was incurred. For good reason perhaps: the positions that caused the loss are still rumored to be open. 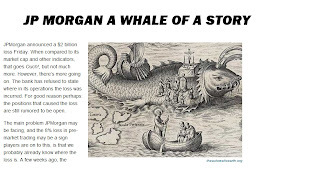 The main problem JPMorgan may be facing, and the 8% loss in pre-market trading may be a sign players are on to this, is that we probably already know where the loss is. 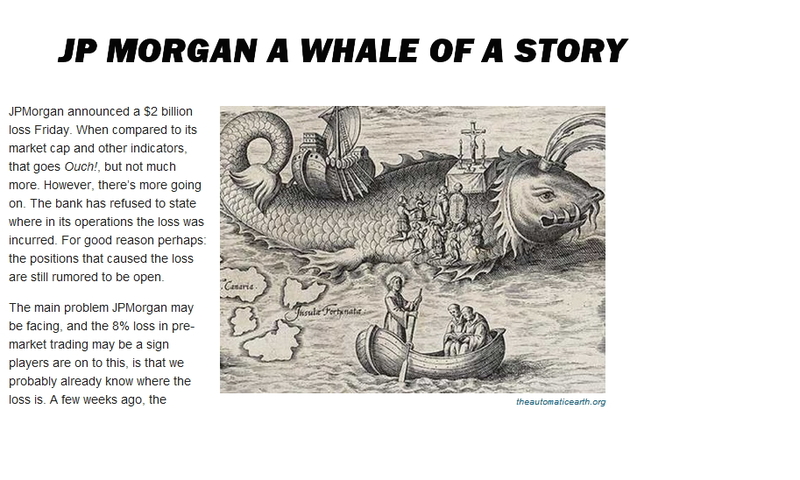 A few weeks ago, the financial sphere was full of stories about the London Whale, a JPM trader in London named Bruno Michel Iksil, who had taken such massive - synthetic - derivative (gambling) positions in a 125 company index that they were moving the market itself. Back then, some hedge funds took counter positions just for the sheer fact that he had bet so much; they figured he couldn't last forever on all trades. The underlying notion was he was long a bunch of companies; well, not a lot has gone well in the markets lately. And if you have overweight derivative positions in one direction (in this case credit default swaps) , you can make a killing or you can get punished fast and furious. He did the latter.